IT’S ALL UP TO YOU. It’s really pretty simple. Choose which model you want, discuss with Doug what’s on your mind about the new bike, or problems with your old bike, and you are on your way! 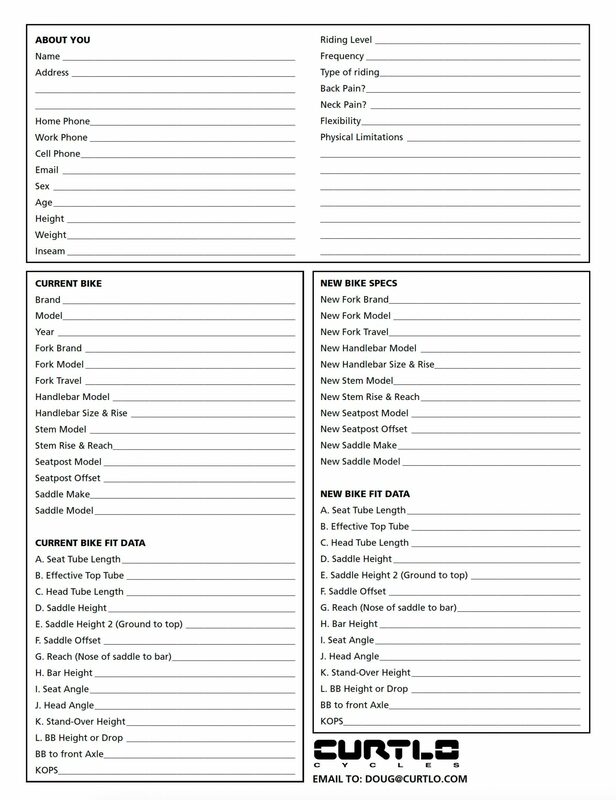 Since each frame is made specifically for the rider (we don’t stock a bunch of frames in standard geometries) we first compile all kinds of information about you and your current bike, then work out the details on your new frame and bike. At Curtlo, we not only custom fit the frame to your body dimensions, but, pay close attention to riding style, abilities/disabilities, likes and dislikes to arrive at a true custom fit. With emphasis on stiffness, handling and compliance, the selection of frame materials and custom manipulation complete the design. With direct interaction with the customer, we can walk you through the process. “Your” input is the most valuable resource for your new frame fit. Together we arrive at the ideal new design. A 50% frame deposit initiates the order. This can be done with a check, credit card, PayPal or Venmo. A collection of data along with details that you are looking for in your new ride starts the design process. Use the diagrams and information below and fill out a Fit Form for us to get started with. Inseam- Barefoot, with back against a wall…slide a book up into the crotch until it fits firmly. Measure from the ground up to the top of the book. Saddle Height– Measure from the center of the BB to top of saddle at midpoint. Saddle Offset– (On level ground) hang plumb-line from nose of saddle…measure how far behind this line is from the center of the BB. Saddle Height 2– Measure from ground up to top of saddle…perpendicular to the ground. Bar Height– Measure from ground up to center of bar where it clamps into the stem. Reach– Measure from the nose of the saddle to the center of the bar where it clamps into the stem. Handlebar- Make, Model and Size. Stem- Make, Model and Size. KOPS- (Knee over pedal spindle)- From right side of bike, place right crank @ 3:00. Hang plumb line from just below knee cap. See where it falls in relation to the pedal spindle…ahead of, behind or right on…and by how much. BB to Front Axle- Measure from center of BB to center of front axle.